During UNPO's XIII General Assembly, which took place at the end of June 2017 in Edinburgh, Scotland, the Report of the General Secretary was presented and disseminated to the congregation of UNPO Members in attendance. Comprising an overview of the organisation's activities over the past two years, the report opens with a letter from the General Secretary and an abridged summary of the progress made since the previous General Assembly. The report also recounts the many endeavours undertaken by UNPO Members and the UNPO Secretariat -- events, missions, advocacy meetings, trainings, publications, projects, and more. As an essential part of UNPO's structure, each successive General Assembly offers an opportunity for UNPO Members to observe and learn more about the important internal and external work that UNPO engages in across the globe. From the last General Assembly held two years ago in Brussels, UNPO has performed an impressive numbers of initiatives, international campaigns, fact-finding missions, trainings, workshops, and very effective political lobbying and advocacy work in many Parliaments. 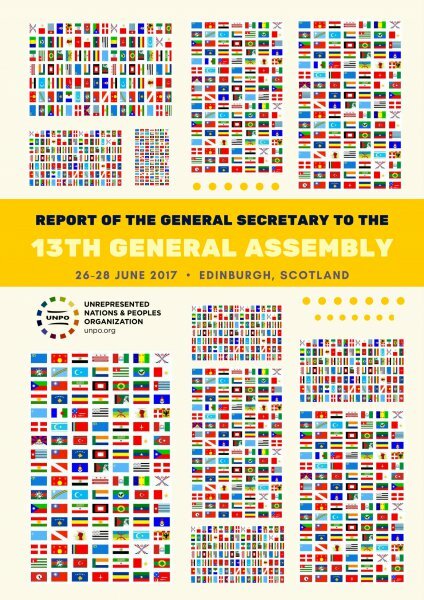 Today, at the Scottish Parliament, I am glad to present you this Report at the XIII UNPO General Assembly convened in Edinburgh, Scotland during June 2017. During the last two years, countless global events have afflicted the world and peoples across borders, oceans, and disputed territories. Civil unrest and violent conflict driven by economic and geopolitical interests are devastating communities in the Middle East, Asia, Africa , Eastern Europe, and Latin America. Increasing instances of terrorism and military counter-measures are putting the lives of millions of innocent civilians at risk. The Rule of Law and respect for fundamental and universal human rights are perpetually disregarded, which leads to a substantial reduction of freedom everywhere, even in democratic countries. The lack of implementation of democracy and protection for human rights gives way to heightened violence, killings, enforced disappearances, torture, arbitrary detention, repression of freedom of religion, ethnic cleansing of minorities, denial of Indigenous rights and different forms of slavery. A general lack of stability, a growing radical populism, and an epochal migrants move, together with millions and millions of displaced peoples and refugees, are undermining peace and democratic growth. The entire world seems to be entering into a state of discord and chaos. The United Nations is operating in a reduced capacity and playing a subsidiary role. The denial of multilateral policy initiatives and unaccomplished reforms turned the UN into a spectator rather than a protagonist. The UN is in need of deep reform; following the League of Nations of Geneva and the UN San Francisco Conference in 1947, there is an evident need for a new era of multilateral engagement. This calls for a new diplomatic conference to redesign international bodies, rules and procedures to allow the world to have a chance. At the end of the 20th century, around 80 conflicts were taking place around the world; today we have reached 116. The international community and its own institutional bodies are not taking responsibility or swift action to prevent these crises. UNPO will continue putting pressure on international actors at every level to compel these bodies to protect the world’s most vulnerable populations. In this situation UNPO will increase its advocacy efforts and campaign for the Rule of Law, democracy, individual and collective rights, freedom of expression, the right to information and the right to know, environmental protection and sustainable development as key issues for global decision- makers. While remaining committed to the founding Charter, UNPO should enact certain reforms in order to maintain the capacity of the organisation to put matters of our Members at the forefront of the International Agenda, and to advance our Members’ aspirations and proposals through democratic and non-violent means. This Report provides a frame of an impressive agenda of initiatives, campaigns, projects, and events realised by UNPO. There is plenty to learn and even more to gain in the future endeavours of UNPO. With the support of its members and the unswerving commitment of the Secretariat, UNPO will become more effective, more influential, and stronger than ever.